Reviewed by Dan Hastings on September 24th, 2017, playing on PC (Microsoft Windows). 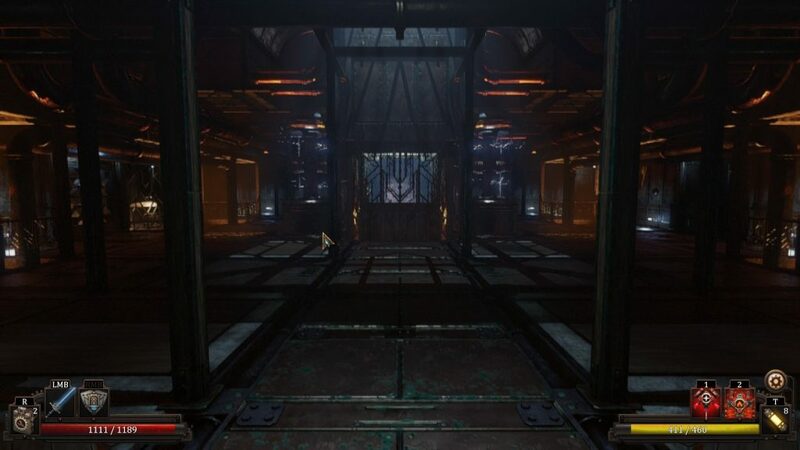 Vaporum is a grid-based first-person dungeon crawler that plays similar to games like The Legend of Grimrock and Dungeon Master, but with a steampunk twist. You wake up next to a large mechanical tower and you are drawn inside. After discovering that things are not quite right, you must work your way through the tower to uncover the mystery of what this place is and what went wrong. 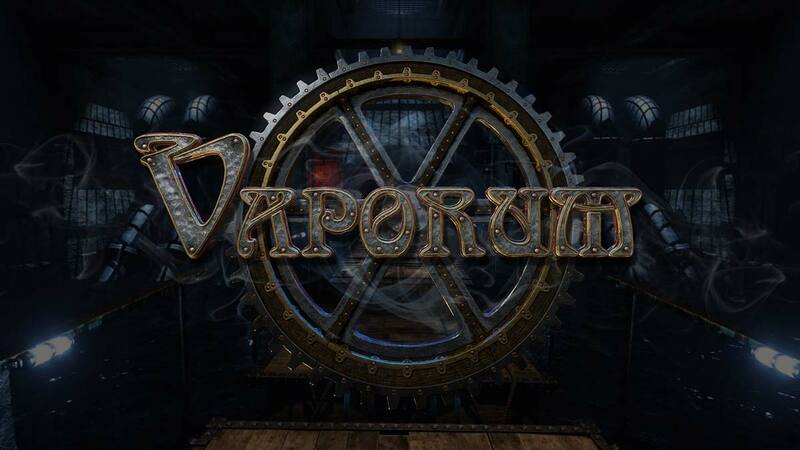 With gameplay elements similar to RPG games, you must fight your way through various enemies and solve some intricate puzzles to uncover the secret of the Vaporum tower. For those unfamiliar with grid-based games like this, it plays quite similar in control to other first-person games, but your movements are restricted by a grid. You can move up, down, left and right, but not diagonally. You can then turn left and right. Enemies in the game are also tied to this grid pattern. For the most part, I had very few complaints about the controls. The one thing that was a little annoying was the mouse sensitivity. It was considerably slower than what I had it set to in windows and there was no way to speed it up. 99% of the time it didn't matter, but accessing your inventory does not pause the game. When you are about to be attacked and need to quickly change some gear, the slowness did get int the way and often made me screw up. 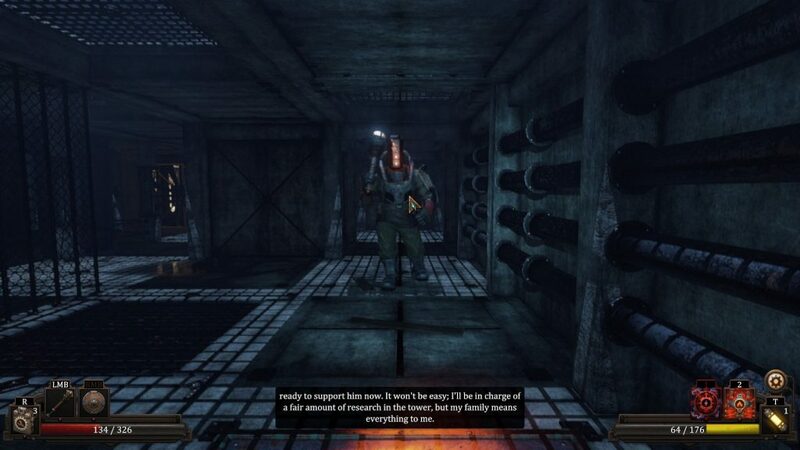 Vaporum features a real-time combat system that works relatively well but gives little room for strategy. You equip a weapon to your left or right hand and then you hold down the respective mouse button and the character will proceed to attack using that weapon. There are no controls to block/parry, although it is possible to block with a shield, it is based on a random chance that you might block automatically. It is possible to dodge enemy attacks by moving out of the way, you can often use this to jump aside and then attack the enemy from behind. The controls do not help you much with this as it is not possible to walk and turn at the same time. During tough battles, I found it easier to just jump to the side to dodge and then jump back and continue fighting. It was not ideal, but it was better than just having 2 people there bashing each other and waiting for someone to die. When you kill an enemy, they will drop some Fumium, which is the glue that holds this game together. There were many times in this game where I felt a lot of similarities to Bioshock/Rapture. The introduction of Fumium was one these times where I felt the similarities between the 2 games. Fumium is an amazing new fuel that has all sorts of powerful and unusual properties, some of which are not fully understood. The effect that this has had on the Vaporum were similar to the effects of ADAM on Rapture. It gives you a good reason to push on with the story as there is a lot of questions that you want answers to. By picking up notes and audio diaries (that have voice acting!) you learn more about what went on in this place. As you play through the game you obtain more Fumium and it is used as if it were XP. Each kill gives you more Fumium and you use it to level up and assign more points to the skill tree of your exo suit. This builds into the RPG elements of the game. 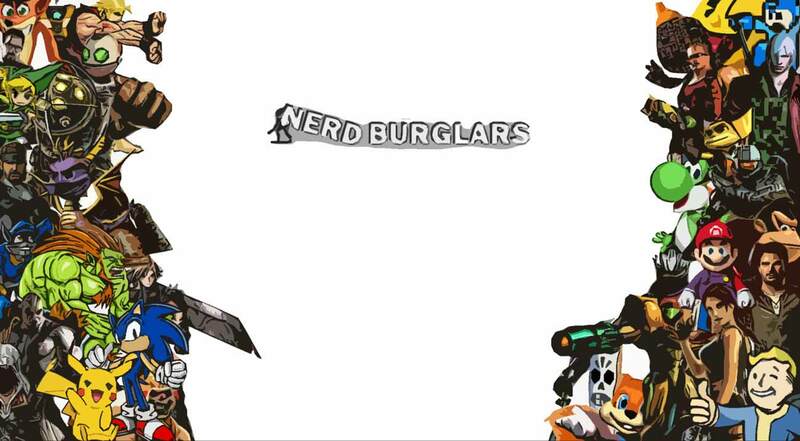 You find various loot such as helmets, shields and all kinds of weapons. You can then equip all this gear and use it in combat. Different weapons have different effects on the enemies you use them on. Swords inflict more damage on living creatures and blunt weapons such as hammers do more damage to robots. Since this is a steampunk game, expect quite a lot of robotic enemies. Enemies in Vaporium come in 2 main types, organic and robotic. 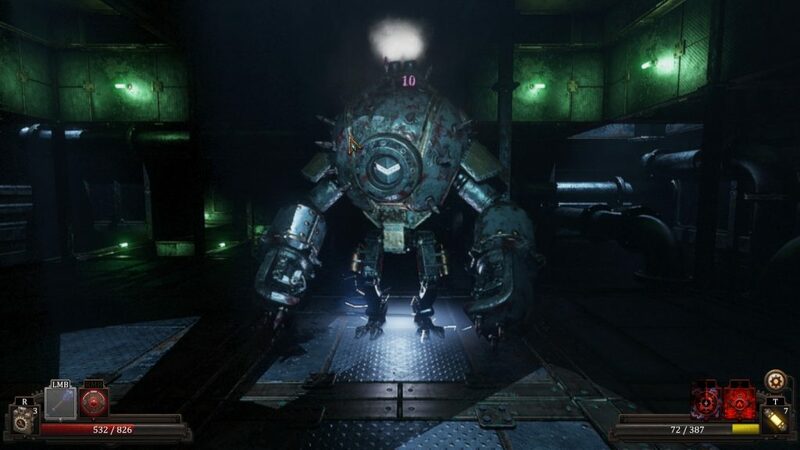 The robotic enemies look pretty cool and are what you would expect from a steampunk game. The organic enemies are a little more unusual, some are unusual creatures that have been mutated from exposure to Fumium. Then there is the one enemy that is practically a Big Daddy straight out of Rapture. I believe these guys are called guardians, but to me, they were a lot like the Alpha series Big Daddy from the second Bioshock game. The levels in the game were a lot less steampunk than I was expecting. They felt very industrial, but It could have been set in the sewers of any industrialised city in the early 1900s. I was expecting a lot more cogs and gears, with modern technology somehow built using components of the past. As you get further into the game, it does improve, but the first 4 or 5 levels are just based on what feels like the sewers of a city with very little technology in the environment to make it feel like a steampunk game. It was like all of the awesome stuff was saved for the last 3 or 4 levels and the early levels were just padding to make the game longer. One thing that is worth saying is the game looks nice. The shadows and lighting make this place feel gloomy and abandoned with the sound effects really helping to build a spooky atmosphere that fit very well with the current events of the story. Putting the limited amount of steampunk aspects aside, the levels were well designed with some really complicated puzzles that are very rewarding to solve. It isn't too often that I need to use pen and paper when I play games, but I did it a lot for this game. I have several pages of drawings where I am trying to work out the puzzles. I found this aspect of the game to be very rewarding and enjoyable. The game is also full of secret areas which contain more difficult puzzles, but the reward for these is often well worth the head scratching. Make sure to save often as the Vaporum is an unforgiving place filled with traps. The RPG elements add a lot more depth to the combat and make the puzzle solving all the more rewarding. Great to have voice acting in an indie game. The early levels in the game didn't feel like they were based in a steampunk world.